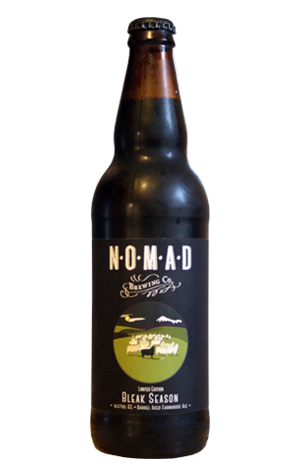 About a year ago Nomad brewed a beer called Bleak Season. It was a dark farmhouse ale made with the addition of roasted wattle seed and cinnamon myrtle and not all of it was sold. Some was transferred into barrels to age, the very same red and white wine barrels that had housed the Cultural Exchange made in collaboration with Texas icons Jester King. After six months in said barrels the intention was to pull it out and package it but, such is the inexact science of barrel ageing, they made the call that it needed more time to develop. A further six months down the line and, here we are, with the emergence of the Bleaker Season and a really interesting beer. When it pours from the bottle it does so in jet black form with a head that’s practically dead – a side effect of the experimental nature of the barrel ageing. You’re hit with an aroma that carries a vinous quality, somewhere between a red wine and subtle vinegar, and that carries through to the palate. Then, in your mouth, it builds layer upon layer, going from liquorice to subtle smoke to oak to indigenous spices to citrus to cola to leather and finishing with an acidic kick. Really. Overall, the mouthfeel is thin, but it matters not because the satisfying amount of complexity means you can work your way through a glass and, even on the very last sip, you're still trying to work out what you're going to end up with. It really is very interesting.